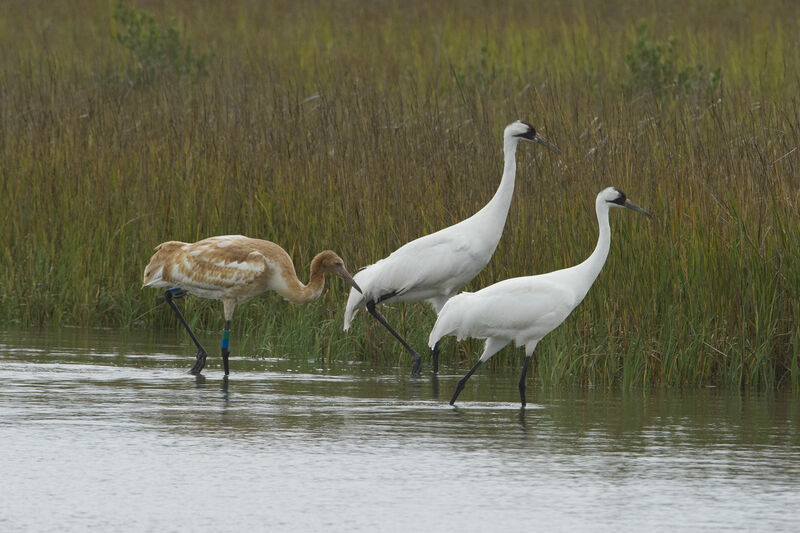 How to identify Whooping Cranes and other large white or gray birds. First let’s study the differences and similarities with Whooping Cranes and Sandhill Cranes. This is important because hunting of Sandhill Cranes is allowed in some areas. In certain conditions, especially in early morning or late afternoon or on cloudy days, hunters have mistaken Whooping Cranes for Sandhills. Misidentification can result in serious problems. So, now is your opportunity to learn more about these endangered birds and help protect them. Whooping Cranes are bright white except for the black primary feathers at the ends of their wings and a red cap on their heads. The black wing tips can only be seen when they are flying. They fly with their necks straight out and legs trailing straight behind their tail feathers. They have a long beak. Whooping Crane adult pair with juvenile. Note that the black wing tips cannot be seen while they are standing. The juvenile whooper is cinnamon color until new white feathers grow in about one year of age. Adult Whooping Crane with two juveniles flying. Some people become confused when they observe the adults and juveniles together believing the cinnamon colored juveniles to be another species. Sandhill Cranes are gray with a small red cap on their heads. They are about 3/4 the size of whooping cranes. They fly with their necks straight out and legs trailing straight behind their tail feathers. They have a long beak. 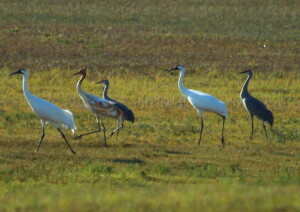 Two adult Whooping Cranes (white), a juvenile Whooping Crane (cinnamon) and two Sandhill Cranes (gray) together in field. Whoopers and Sandhill cranes occasionally travel and feed together. One adult Whooping Crane (white) flying with seven Sandhill cranes. When the two species are together they are more easily identified correctly. There are several other species of birds that at a distance appear similar to Whooping Cranes. Review the following check list to help you in identification. 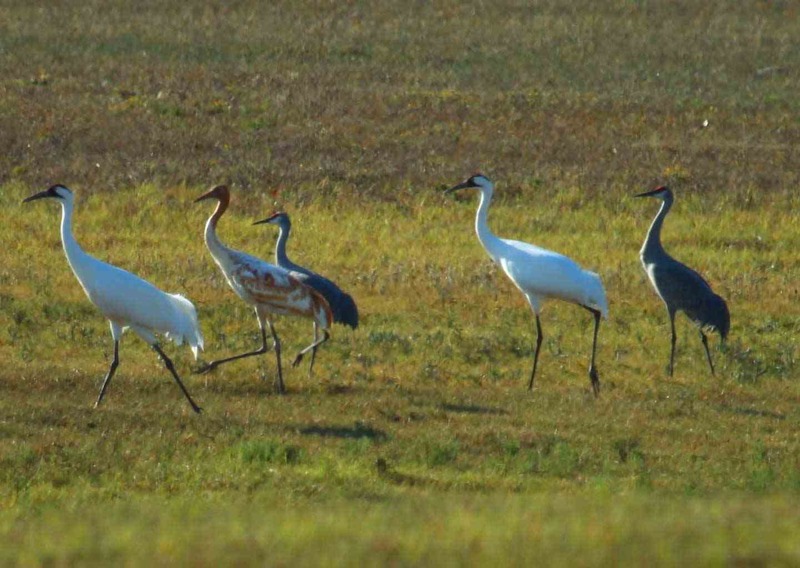 Then scroll down to see the several bird species that can be mistaken for Whooping Cranes. Finally take the identification test at the end. 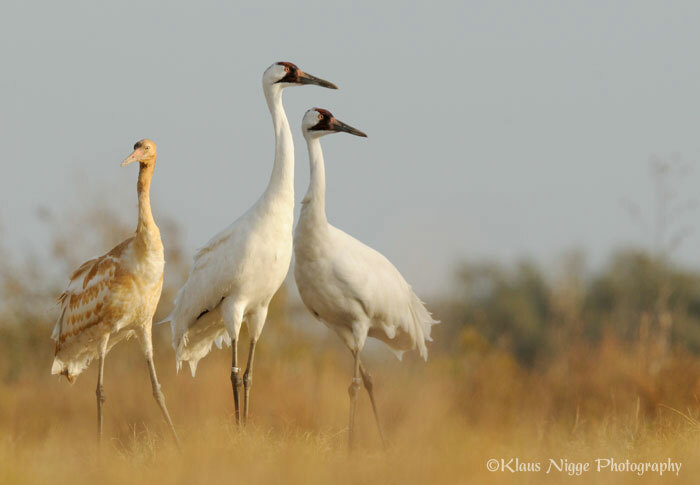 HEIGHT — Whooping Cranes stand nearly 5 feet tall. They will be the tallest bird you see. COLOR — adult birds have bodies that are pure white except for a red patch on the head, a black “mustache” and black wig tips. Juvenile birds will have rusty or cinnamon colored feathers with the white. WINGS — the wingtips (primary feathers) are black in Whooping Cranes, but black does not extend all the way along the wing edge to the body. Wingspan is 7-1/2 feet. The black can be observed only when the whoopers are flying or stretching their wings. 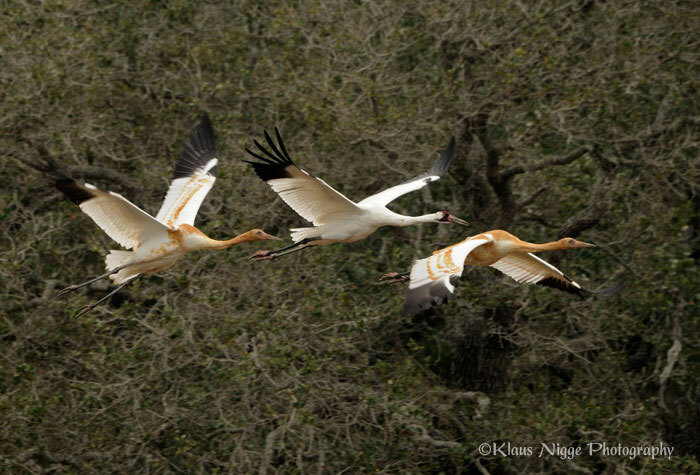 FLIGHT — Whooping Cranes fly with long necks and long legs fully extended. Wing beats are slow and steady. FLOCK — Whooping Cranes usually travel and feed in small groups — from one to eight birds. 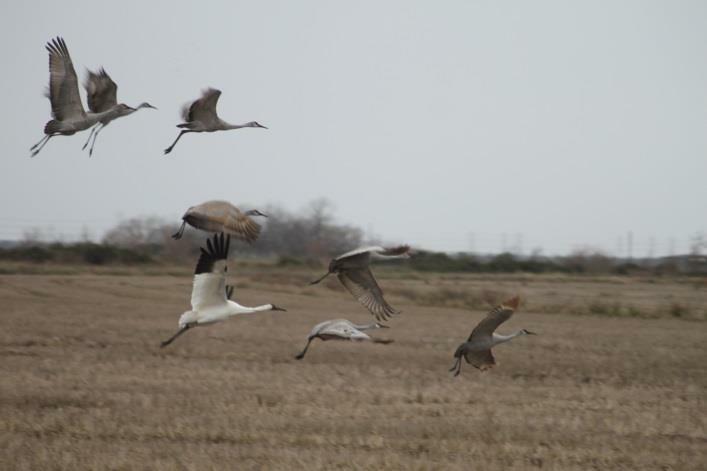 They may sometimes travel with Sandhill Cranes, but never as a large flock of Whooping Cranes. VOICE — whoopers are known for their loud, bugling call. In flight they may produce a deep trill, similar to Sandhill cranes. WHEN — Whooping Cranes normally start their migration from Canada in late September. Their migration is 2,500 miles and may require several weeks. They normally arrive on the Texas coast in mid-October and migrate back to Canada to nest by late April. Whooping Crane pair with juvenile. Click image to enlarge. American White Pelicans can look like Whooping Cranes in flight especially at a distance. 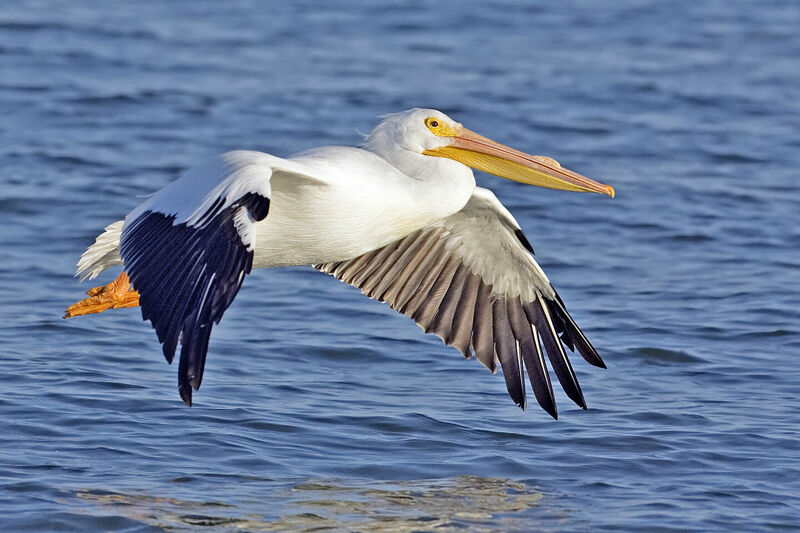 They have a large wing-span (9 feet), and the long bill can give the appearance of a long neck in flight. Unlike the Whooping Crane, their legs do not extend beyond the tail in flight, and the black on the wings extends all the way to the body. They often circle and soar in large groups. Click image to enlarge. Courtesy Alan D. Wilson. 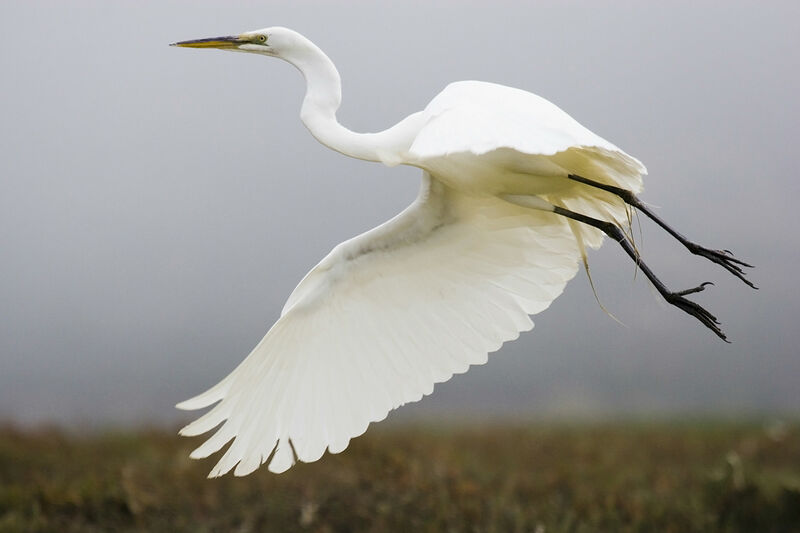 Great Egrets are common wetland birds. Their long legs extend beyond the body in flight, but the long neck is usually tucked in flight. Their all-white wings have a 4-1/2 feet wingspan. Click image to enlarge. Courtesy Michael L. Baird. 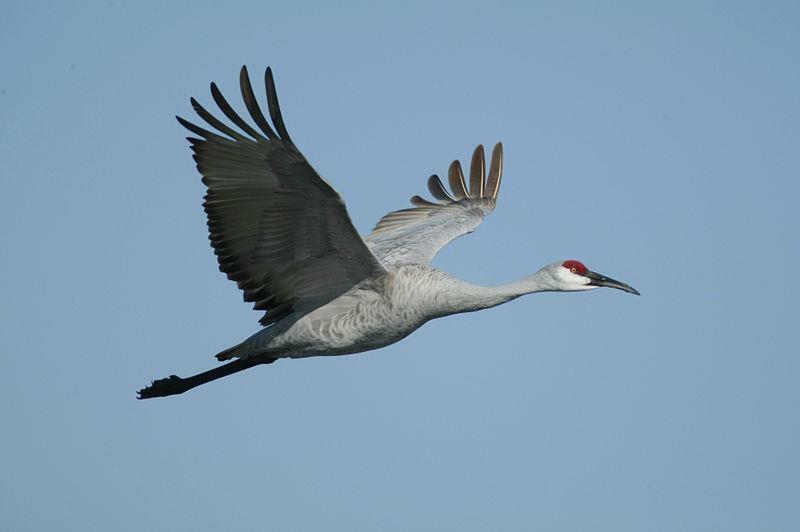 Sandhill Cranes are related to Whooping Cranes, but are smaller (4 feet in height; 6-1/2 feet wingspan). Color is gray, with slightly darker wingtips. They can be found in large flocks. Click image to enlarge. Courtesy Steve Emmons. 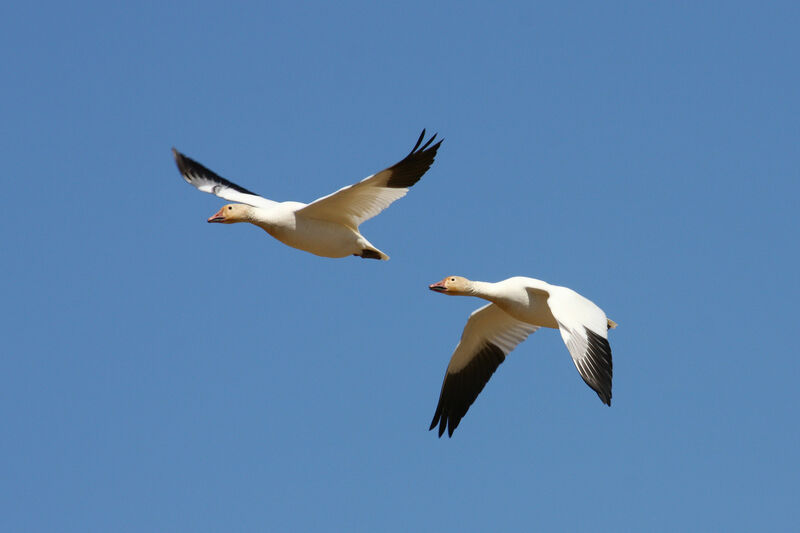 Like Whooping Cranes, Snow Geese are white with black wingtips, but their legs do not extend beyond the body during flight. Wingspan is 4-1/2 feet. Their beak is short. They are often found in large flocks. Click image to enlarge. Courtesy Cephas. 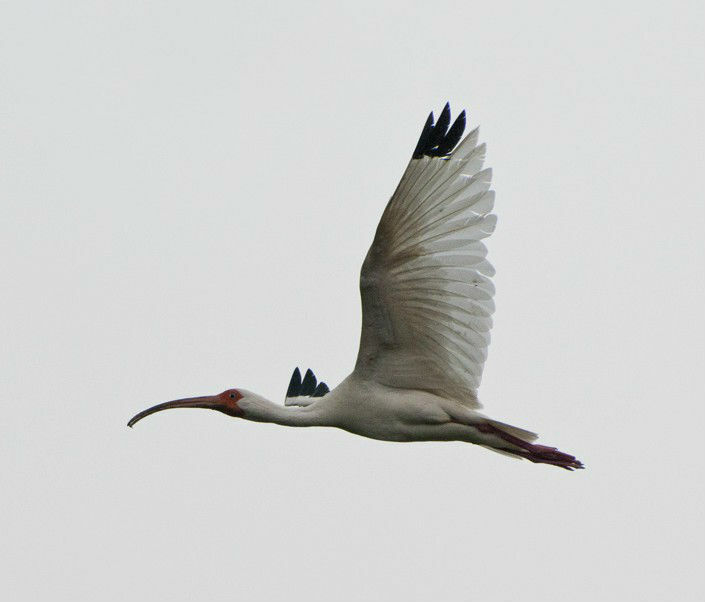 American White Ibis have long necks and legs that are extended in flight, but they have a long, curved bill. The wings have only a small patch of black on the wingtips and reach only 3 feet in wingspan. Click image to enlarge. Courtesy Mike Fisher. 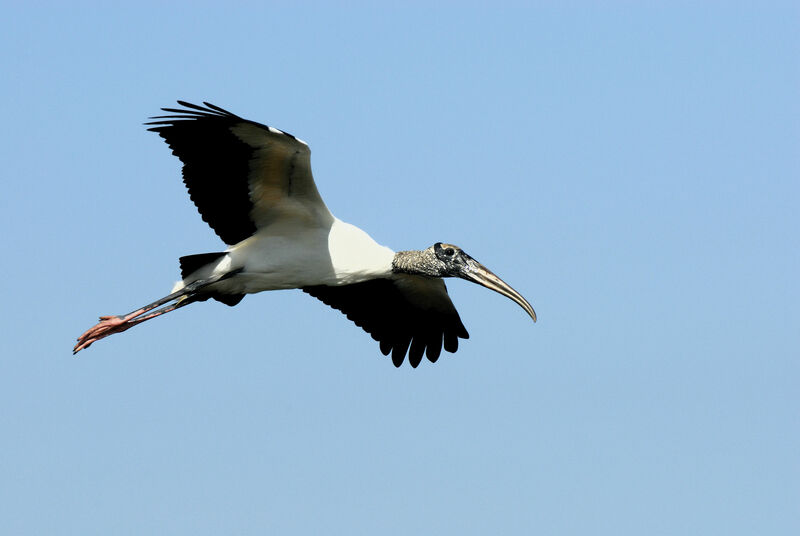 Wood Storks have long necks and legs that are extended in flight; however, the black on the wings extends all the way to the body. Black may also be visible on the neck and the tail. Their wingspan is 5-1/2 feet. They flap slowly, glide, and soar. Click image to enlarge. Courtesy Hans Stieglitz. Black-and-White Birds: Which Are Cranes? Images copyright Journey North. All Rights Reserved. To identify the birds, click on each photo to enlarge and get information in the link. Have you figured out how to identify a whooper? Test your knowledge! Find one or more pictures that you think show Whooping Cranes. Click on the picture to see if you are right! Now that you are more knowledgeable about identifying Whooping Cranes, we need your help. If you are certain that you have spotted a Whooping Crane, please report it. Your information, along with that submitted by others helps us to keep tabs on the Whoopers. Friends of the Wild Whoopers appreciates the cooperation of Laura Erickson, several photographers and the Texas Parks and Wildlife Department in developing this identification document. Hopefully it will serve to help protect endangered Whooping Cranes and birds that resemble them. Please let your friends and associates know about this identification guide.